New England Patriots defensive lineman Vince Wilfork rescued a woman injured in a car crash, hours after helping his team reach the Super Bowl. Earlier, the 33-year-old had played in his side's 45-7 defeat of Indianapolis Colts in the AFC Championship game. 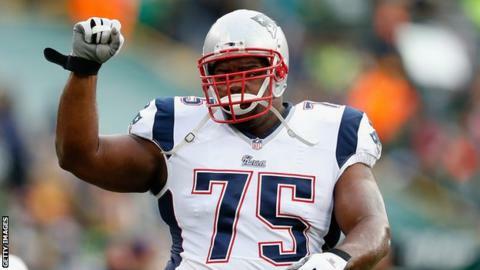 But on his way home from the Gillette Stadium with his wife, Wilfork saw a jeep roll over with a woman inside. "The only thing I thought about was seeing somebody in there and getting them to safety," he said. Wilfork, who weighs 23st 3lb (146.1kg), reached into the jeep and pulled the woman out with one hand. The 38-year-old woman was subsequently charged with driving under the influence of alcohol and negligent operation of a motor vehicle.